Home > Drive > Advice and guides > Know how > Can electric cars tow? One of the biggest reasons for people not to consider an electric car, is that it simply doesn’t meet their requirements. 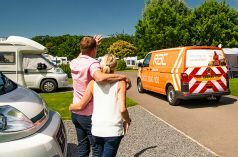 Whether that’s the ability to travel long distances without stopping, transport a large family or be able to tow a trailer or caravan, there’s often a barrier to electric car purchase. The argument we’re tackling here is around towing, looking at not only can you tow using an electric car, but should you? Can I tow using an electric car? Technically, in most cases, the answer is ‘yes’. With instant torque from a standstill, they should be even better than petrol or diesel engines for lugging a caravan or similar, right? Well, to an extent. But while most cars would be perfectly capable of towing, very few have been type-approved to tow. Before any new car is launched, it has to pass through homologation. This is a process of testing that allows the relevant authorities to ensure it meets all the requirements to be registered and driven on the road. Manufacturers of most electric cars haven’t sought type approval from the European authorities to declare them fit for towing. Why wouldn’t they? The simple answer is because towing a trailer is not something the majority of electric cars are designed to do. Drive around a city: yes; lug a trailer to the tip: no. It’s just not a priority. Besides, if EV manufacturers did seek type approval for towing, doing so would drastically decrease their efficiency and reduce their range. And that’s some bad publicity electric cars could do without. There’s also the weight of an electric car to consider. With all its batteries, the Nissan Leaf has a kerb weight of around 1,500kg depending on spec – 300kg more than an equivalent petrol Volkswagen Golf. Therefore, its components, such as brakes and suspension, are already under more pressure, before adding the weight of a trailer. There’s also concern around what happens during slowing down in an electric vehicle. Most feature regenerative braking that, to put it simply, converts kinetic energy and pumps it back into the battery when you’re slowing down. Just lifting off the accelerator pedal in some electric vehicles creates a braking effect, and that could have an unwanted effect on a trailer if you’re unprepared. An excess of kinetic energy created by the car and trailer together also has potential to damage the powertrain. If you own an electric car that hasn’t been type-approved for towing, don’t ignore the rules and go ahead anyway. Doing so is likely to invalidate both your warranty and insurance, meaning you could be hit with a heavy penalty if you’re pulled over by the police or involved in a collision. If a car hasn’t been approved for towing, it means you (or the manufacturer, or the authorities) have no idea how it will behave, either. It could start swaying, or struggle to come to a stop in an emergency. Which electric cars can tow? Having said all this, there are a handful of electrified vehicles that are certified for towing. 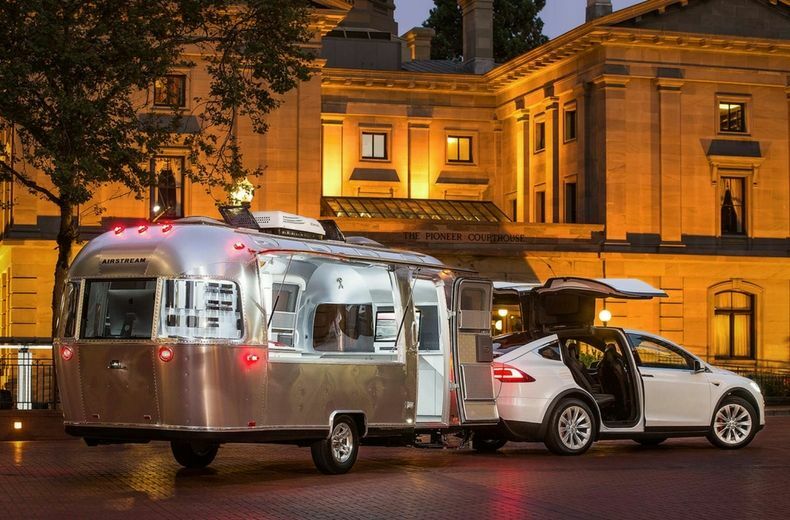 The only battery electric vehicle (BEV) currently on the market that can tow a trailer is the Tesla Model X. This has an impressive maximum towing weight of 2,270kg and a clever ‘trailer mode’, which disables many of the car’s driver-assistance features such as active cruise control. It also has trailer sway mitigation, which automatically applies the brakes to individual wheels when it detects a swaying trailer. 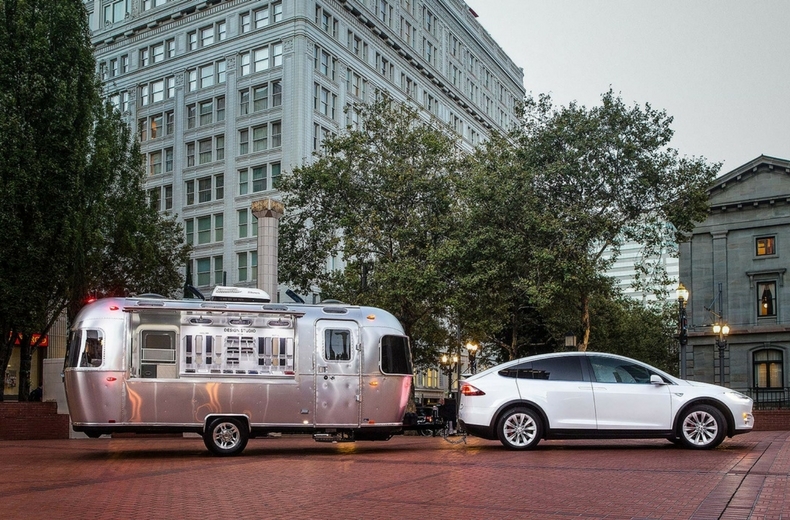 As an eco-friendly caravan hauler, the Model X makes a great purchase. But its £76,500 start-price means you’ll pay a hefty excess compared to a conventional diesel SUV, and you should be aware that the Model X’s impressive range (up to 295 miles) will be significantly reduced when towing. Can’t afford a Tesla? There are alternatives, in the form of plug-in hybrid electric cars. These combine a conventional engine with an electric motor, like a conventional hybrid, but can also be plugged in if you want to top up the battery from an external source. They are a good compromise: most can travel under electric power alone – great if your commute is less than its electric-only range, for example – but are also capable of using a conventional motor for longer journeys. The disadvantage is the fuel economy if you rely on the petrol engine. If you don’t charge it, a plug-in hybrid is essentially a petrol car with the extra, heavy weight of the batteries to lug around. Add a trailer to that, and you could be looking at much lower fuel economy versus a traditional diesel tow car. The most popular alternatively-fuelled towcar on the market is the Mitsubishi Outlander PHEV. Priced from £31,805 after the government grant, it’s much more attainable than a Tesla Model X. With a 1,500kg limit for a braked trailer (500kg less than the diesel), it’s capable of towing most caravans, and it also has the advantage of being an SUV – with all the practicality that brings. Four-wheel drive and extra ground clearance might also come in handy on some caravan sites, or if you’re hoping to tow a trailer through a muddy field. Moving up in price, the Volvo XC90 T8 is capable of lugging up to 2,400kg. Described by the manufacturer as a ‘twin engine’, the T8 pairs a 2.0-litre petrol engine with an electric motor, producing a combined 407hp. While you won’t see the official 134.5mpg while towing a trailer, its luxury interior makes it the plug-in hybrid we’d choose for a weekend away with a caravan. BMW also offers a plug-in hybrid version of its X5, the 40e, while Audi sells the Q7 e-tron. These can tow 2,700kg and 2,800kg respectively – considerably more than most people would need. They’re both big and powerful enough to make towing a trailer a pleasure. 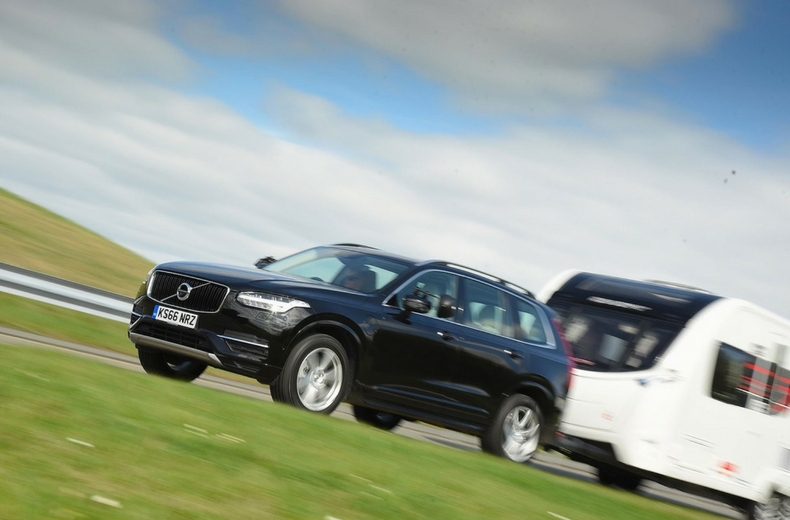 And, like the Volvo, the interiors of both make them pleasant companions for a fortnight towing a caravan around Europe. You don’t need to spend big bucks on a luxury plug-in hybrid SUV to tow, however. At the lower end of the market, there are family hatchbacks such as the £28,135 (after the Plug-in Car Grant) Volkswagen Golf GTE and the closely related Audi A3 e-tron. The former can tow a braked trailer of 1,500kg, while the Audi has a limit of 1,600kg. What else do I need to know about towing with an electric car? The key message is to do your homework before you buy an electric or plug-in hybrid car for towing. Make sure it’s certified to tow the trailer you require. If possible, we’d always opt for a more capable vehicle than necessary; not only does it save you from having to upgrade if you get a bigger trailer or caravan, a car towing close to its maximum capacity will always be more strained than a bigger, more powerful one only towing half its maximum. Furthermore, check your weights. Tow car experts recommend a process called ‘outfit matching’. This means first, discovering the maximum technically permissible laden mass – MTPLM – of the trailer or caravan. This figure should not be more than 85% of the car: divide the MTPLM by 0.85 to find the target weight of the car. This is where heavier electric cars could have an advantage in the future – by ensuring the car is heavier than the caravan, it can avoid unstable situations where the ‘tail wags the dog’. Never tow a trailer or caravan that’s heavier than the car. Consider the kind of journeys you do with the car and how often you tow with it. If it spends most of its life towing, it might make more sense to buy a diesel rather than put up with the decreased range and increased fuel consumption of a plug-in hybrid towing a trailer. You should also consider your own abilities and what your driving licence allows you to tow. If you’ve passed your driving test since 1 January 1997, your standard UK driving licence will cover categories B and B1. This allows you to drive a vehicle up to 3,500kg and tow a small trailer, up to 750kg, behind it. It also means the whole outfit must not exceed 3,500kg (and the trailer should not weigh more than the car). If you want to tow a heavier combination, you’ll have to sit a special towing test, which adds the B+E categories to your licence. If you took your test before 1997, you’ll already have this entitlement on your licence, but you may wish to take extra training before towing a large trailer anyway. 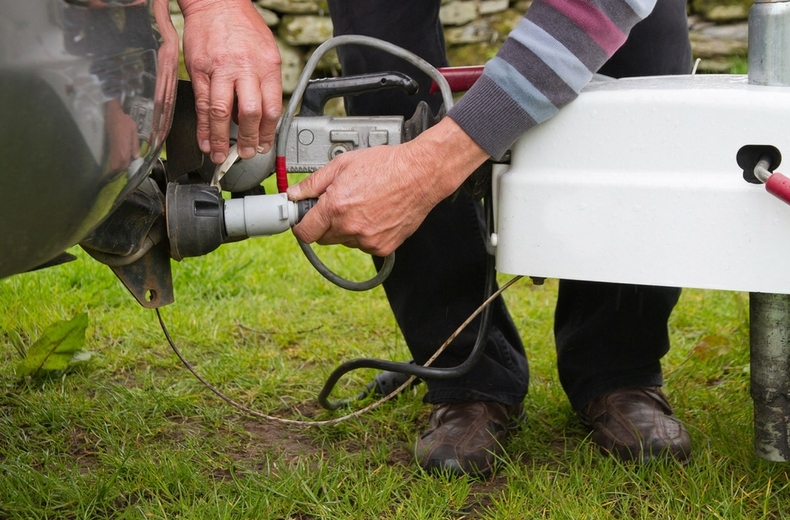 For more towing advice, read our full guide to towing a caravan.